Comfortable room decorated in pastel tones. 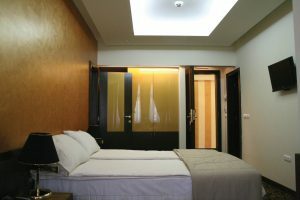 Standard rooms are equipped with shower or bathtub and some of them with balcony overlooking hotel garden. Each room is air conditioned and has a flat-screen TV with international TV channels, cozy king size bed and spacious wardrobe.